The world´s most famous puzzle: The Rubik´s Cube. Created by Gonçalo Gil and Gustavo Sereno, this is a “must have” if you like the world´s most famous puzzle: The Rubik´s Cube. The routine is simple: There is a structure on stage covered with a red cloth. The magician shows a shuffled Rubik´s cube and he can give it to a member of the audience by saying that will be his prediction for what is about to happen. Then, the magician shows some cards with different personalities and the spectator will select one. A solved Rubik´s cube is given to the spectator and he may sign the center square so that that it can be the only cube in the world. The spectator may shuffle the cube as much as he wants. The Magician asks the spectator what was the personality that he has chosen a few moments ago. 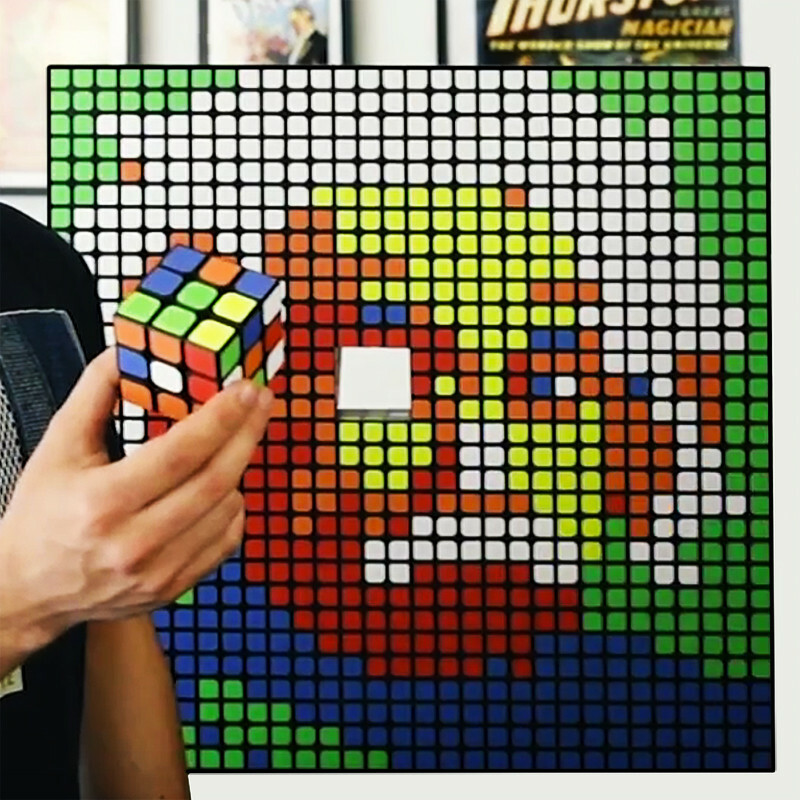 When he uncovers the structure, there are 100 Rubik´s cubes with a draw of the chosen famous character. There is one cube missing on the frame, the magician will pick the shuffled and signed cube and it will match perfectly to complete the picture. But this miracle is not finished yet… In the beginning of the routine, the magician gave one cube has a prediction, then he takes the sign cube from the frame and all the 6 faces will match. The best thing about it, is that the magician can give everything for examination and give the cubes as a souvenir.